The late 1970s was an era of heavy metal motorcycling. Power outputs were on the rise and surpassed only by the sheer weight of the machines the engines lived in. 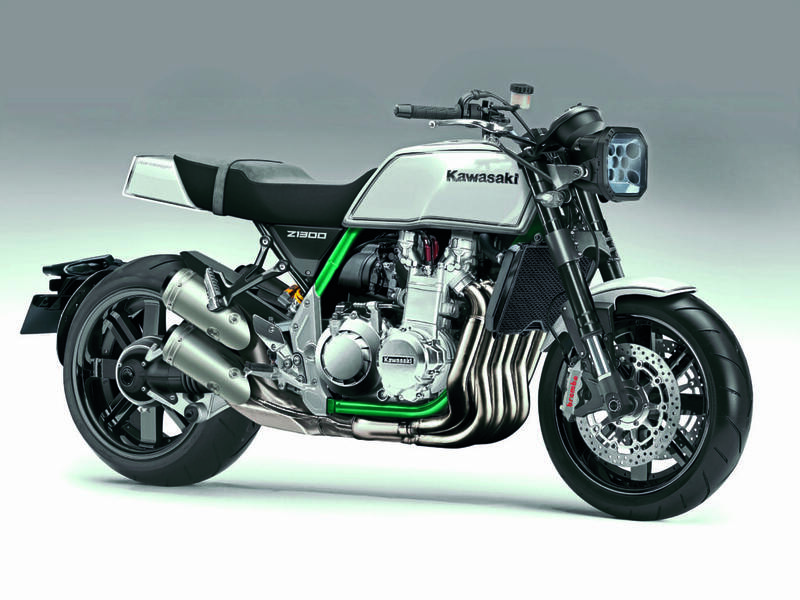 Few were heavier and more of a handful in a corner (or merely attempting to put it on its (centrestand) than Kawasaki’s entry into the six-cylinder market. From 1978 through to 1989, the only water-cooled parallel six at the time went from carburettors to fuel injection to full dress tourer. 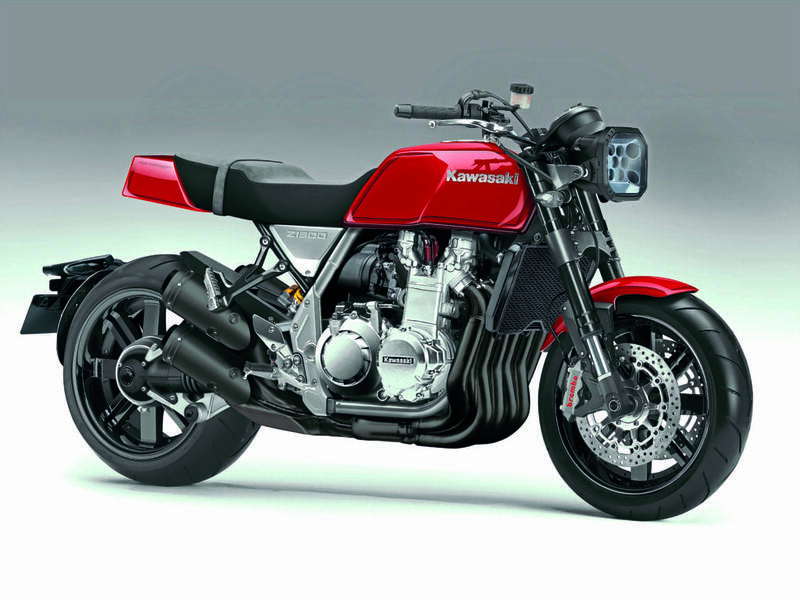 The 320 kilo-plus Z1300 commanded respect on the road with the presence and styling of a Chieftain tank. 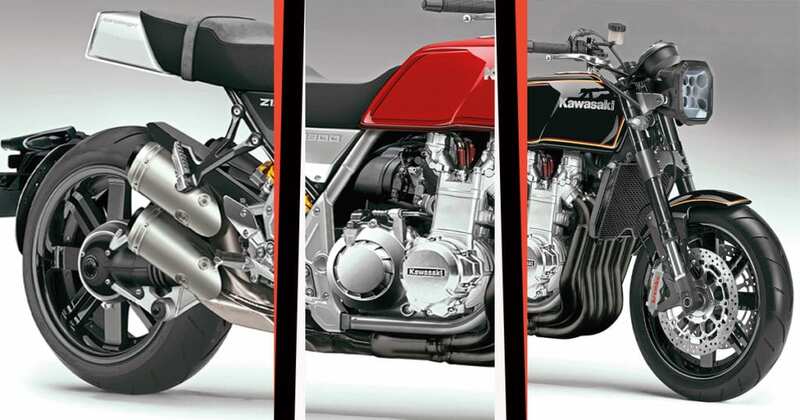 A motorcycle that made even Honda’s six-cylinder CBX look moped-like in comparison, we’ve given it a makeover for 2017. The five-speed 1286cc six was ground-breaking at the time and that technology came at a cost in terms of weight. With water-cooling came a radiator as well as the necessary plumbing but the 120bhp on the triple-carburettor original was boosted to 130bhp for the fuel-injected version. 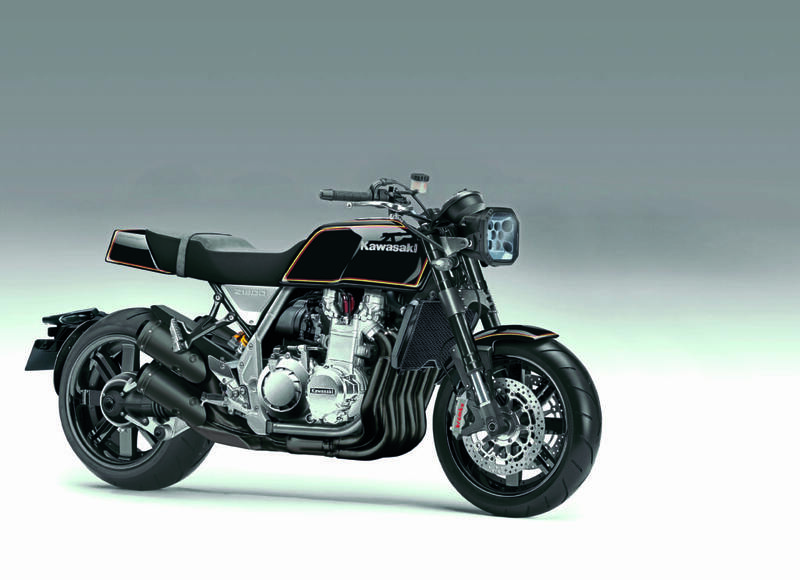 With lighter internals and cases we reckon 180bhp and over 100lb-ft of torque is within easy reach, all delivered via the advanced Tetra-Lever shaft drive from Kawasaki’s own GTR1400. The six-into-four exhaust system shuns the mega-silencer styling so typical of the Kawasaki range for a sleeker, more slimming look. that the big Zed was famed for. An LED headlamp – square of course – lights up the road ahead while a mudguard mounted on the rear wheel hub keeps the back-end profile clean. Boasting a beefed-up cradle frame and utilising central alloy section plates, it’s not only lighter than the original but twice as strong. With a monoshock rising-rate system at the back, inverted forks at the front and lighter, but wider wheels with modern tyres, corners are no longer a lottery where you cross everything and hope for the best. Brembo radial calipers and massive 330mm discs provide actual stopping power the 1978 original can only dream of.